There’s nothing more personal than choosing a piece of jewelry that fits your personality. The right one, with special details, adds a sentimental touch to every outfit. But sometimes it can be hard to find just the right necklace. Fear not! Here’s a great idea: make your own necklace instead of buying one. It’s a really fun hobby to get into and it’s much easier than you think if you have the right supplies. Here’s an easy tutorial to get you started. 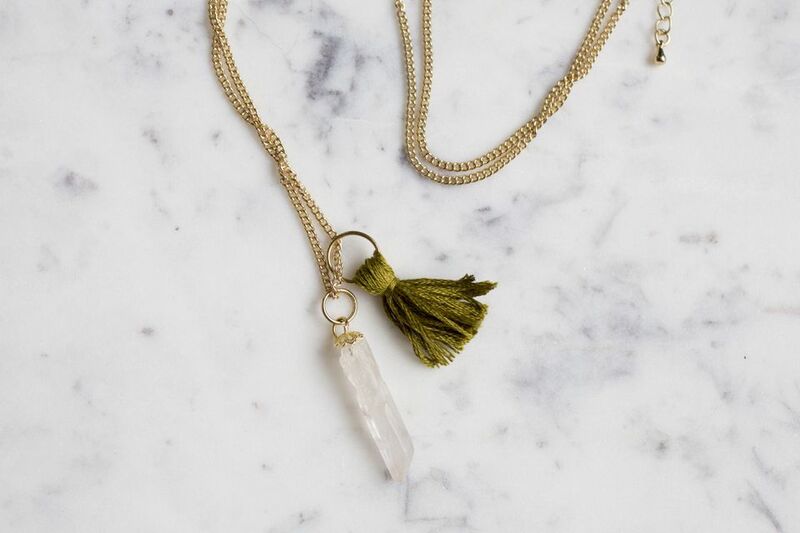 Your options to creating your own necklace are endless—so don’t be afraid to get creative. 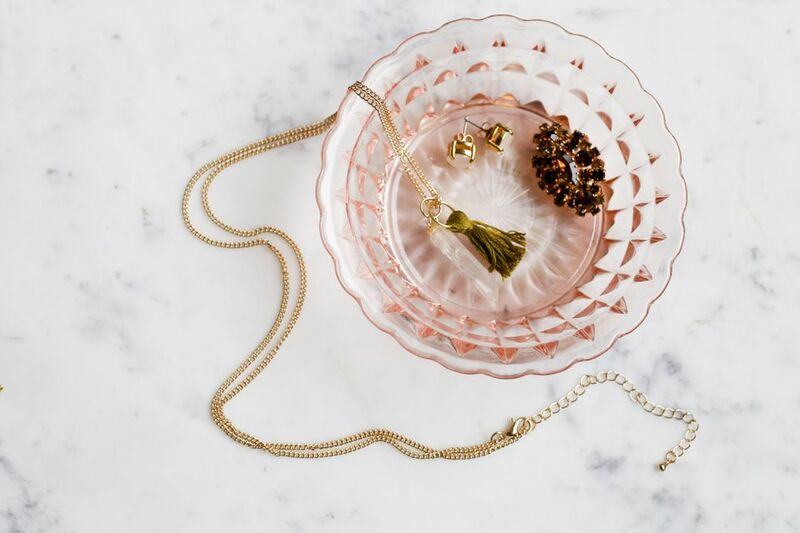 While we’ve chosen a few specific materials, you can transform old earring or brooches into necklace pendants or paint small wooden shapes for an interesting geometric look. Add as much or as little as you want. The beauty here is that you get to choose colors, shapes, and objects that mean something to you for a fraction of the cost of buying something at your favorite boutique. While a lot of these pieces can be found at a craft store, to get the look or finish you really want, it might be worth visiting a specialty store that sells jewelry making supplies. Get inspired! Whether you’re drawing from a favorite piece that you can’t quite afford or looking to add a personal touch to your jewelry box, you want to create a piece that feels like you. And that takes a minute of thought and consideration. In this case, we chose a piece of stone that would work with the colors in our wardrobe and added a complimentary tassel for a fun pop of color. This piece feels playful and contemporary, without the high price tag. The really important part here is to choose a stone or crystal that you love. Each type has a different meaning and some have different energies, so choose wisely! Using your small bamboo skewer, very carefully apply your craft adhesive to the underside of the bead cap. Stick it to the top of your stone and depending on how large the stone is, you may have to bend the edges to conform to its shape. Using your connector ring, loop it through the top of the bead cap and then close the loop on your necklace chain. Easy right? Make sure you let the glue dry according to the package directions before adding this new charm to your chain. A note on the necklace chain: you don’t have to buy a chain that comes with clasps attached, but for more novice jewelry makers it might be a smart move. Attaching them is just one more extra step and can be costly to buy the pieces (chain and clasps) separately. Start forming your tassel. You’ll be shocked by how easy it is and how adorable the finished product looks. Cut a bunch of strands that are the same length. Be sure to cut them a little longer than needed because you can always cut more off, but you won’t be able to add any back on! Once you have a nice bunch of string, you’ll want to fold it in half–the folded ends of the string will form the top of the tassel. Slip a connecting ring through the top end of the tassel and then, using a separate piece of string, tie it around the top to complete the tassel. Double knot the string so you know it will stay in place. You can then move that string up and down to change the size of the top of the tassel. Trim off any excess string you have on the bottom until you’re pleased with the size. Figure out where the center of the necklace is and where you want the charms to sit based on your neckline and the length of the chain. Using your small pliers–attach via the connecting rings–add your homemade charms to your necklace chain. Be sure that the rings are closed completely so you don’t accidentally lose them. Now that you’ve mastered some of the basics, you can use these same techniques to create all kinds of necklaces, bracelets, and even earrings.